Featured Member – Mullinax Inc.
Our Featured Member for March 2012 is Mullinax Inc.
Mullinax also offers trainings for contractors through seminars and on-site classes. They continue to serve the community through these trainings and education of their industry. Growth can create its own problems. Mullinax now has a lack of space. Their 80 acres on Fort Road in Sheridan are full, and they are looking at acquiring more land to continue to expand this home-grown business. Another challenge revolves around the permitting regulations and heavy taxation on the products, which has pushed Mullinax to get involved in the legislative process that addresses these issues. They currently have two full-time employees managing safety and DEQ, MSHA and County regulations. And Mullinax faces yet another challenge in today’s market – competition. Being a “mom and pop” operation is extremely rare in today’s economy. With larger corporations that have dozens of plants and extremely large mother companies around the country, competition can be fierce. These challenges require innovation for smaller businesses to survive and be competitive, which Mullinax has done with their diversification into agriculture, construction and energy. Although Mullinax’s main focus is to be a construction supply and materials company, they have recently worked on a large project from start to finish that deserves mention. At the Polo Ranch out in Big Horn, Mullinax tackled the project of building a polo field from design, installing irrigation, laying dirt work, and seeding. 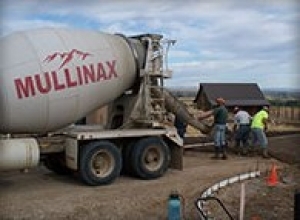 Mullinax prides itself on offering outstanding service and on having been a trusted name on construction sites, ranches, and in homes and businesses for over 60 years. Contact their offices at (307) 674-4466 for your construction supply, construction material, or coal needs. You can also visit their website – www.mullinax-inc.com – for more information about the company.